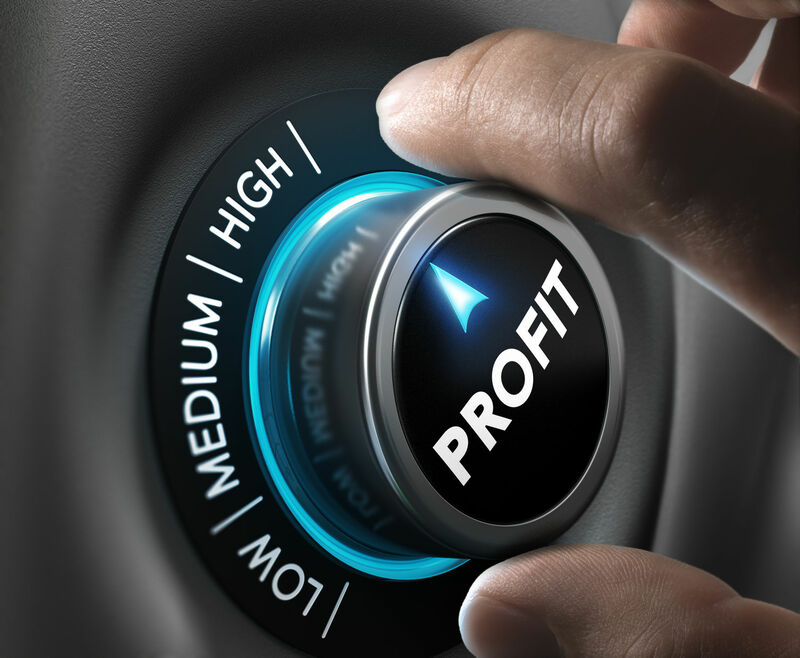 Do you know which opportunities will give your business the highest returns? Does your team or organization struggle to gain agreement on what to pursue and what to drop? It’s tough to stay on track. So many issues and opportunities call for our attention. It’s even tougher when people need to work together and figure out what to do. Which new products or services are the most attractive for a technology business to develop? Which customer prospects does a retailer want to focus upon to build her business? How can hundreds of employees work together to thrive amidst change? In each of these situations, the objective is to identify the most promising opportunities. I’ll describe the steps in the process and then give some examples of how it’s helped businesses improve their performance. Briefly state what you hope to accomplish. Write down all of the opportunities that you can think of to accomplish your objective. Rate how beneficial each opportunity is (high or low). Then determine what level of resources–time, effort, and money–would be required to pursue it. Opportunities with high benefit but high resources are shown as question marks. Is the return great enough to warrant the effort? Most organizations or teams can only support one or two question marks at a time. There’s just too much effort involved. Sometimes, participants can identify ways to pursue the question marks with less effort so that they become stars. The check marks are like popcorn–low benefit but low cost. These are OK to pursue as long as they don’t distract from the stars. Finally, the X’s are losers whose high resource requirements outweigh the benefits. Select the best combination of opportunities to accomplish what you hope to achieve. You may need to do some of the things that show up as check marks before you can accomplish the stars. Now let’s look at how the process helps businesses succeed. You can identify superior business opportunities and avoid losers. For example, as a start-up company in the early days of online services, we selected instant stock market information and trading as our niche. Investors placed a high value on up-to-date information and unencumbered trading. Fortunately, the company could display this text and numerical data efficiently, even with the painfully slow 300-baud modems of the mid-1980s. Thus, our business clearly had a star opportunity. In contrast, Fortune 500 companies focused upon putting things like the daily newspaper online. However, consumers weren’t willing to wait for long downloads and pay dollars of connect time for something they could buy for 25 cents. After hundreds of millions of dollars in investment in low benefit-high resource services (X’s), these players dropped out of the market. It gets the opportunities out of your head and down where you can evaluate them. The members of a fast-growing professional services firm felt swamped. They wanted to do everything, but just couldn’t keep up. I guided them through the “Opportunity Sorter” process. Within a few hours, they defined a shared set of priorities and plans. Their business is growing, more profitable, and less stressful. You can achieve agreement with a large number of persons quickly and effectively. Typical group discussions get sidetracked on unpromising opportunities or ego conflicts. The “Opportunity Sorter” involves everyone without people shooting down others’ ideas. Businesses ranging from multi-store retailers to production plants and groups of managers and employees numbering 100 or more have met together and agreed upon key opportunities and plans. This process especially helps where participants don’t have a lot of experience working together, like at board and management retreats. Everyone participates, and the best opportunities rise to the top. 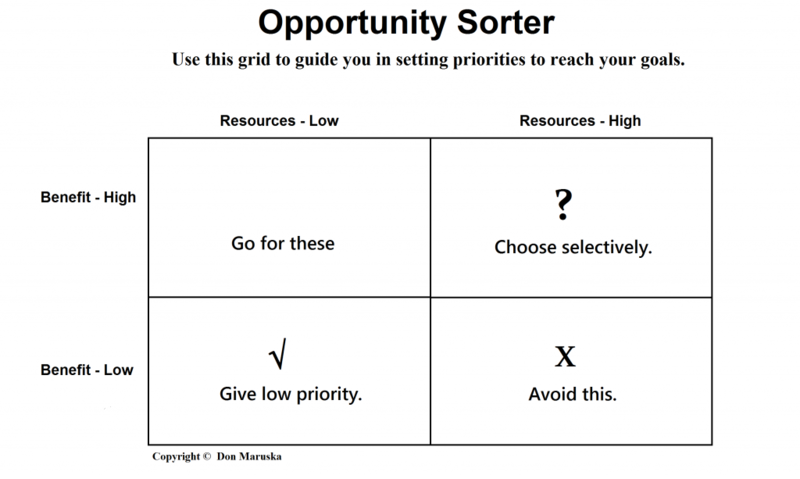 The “Opportunity Sorter” helps teams stay focused. The engineering group at a production plant had twice as many project requests as it could ever fulfill. They used the grid to sort the projects with other departments. Everyone got behind the important projects and deleted the least attractive ones. Plant performance improved, and morale rose with a more manageable workload. The “Opportunity Sorter” is a graphical way to identify the best returns and to rally your team to achieve them.